Canon is expected to announce the EOS-M4 mirrorless camera and at least two EF-M prime lens in Q1 to Q2 of 2016 to beef up their mirrorless product line. This will not be enough to make them a big player in this space. Although Canon's mirrorless cameras are selling quite well in Asia and Japan, they are mostly lower end models and bring in little profits. They need to go upmarket and take a leaf from Sony and most recently, Leica. Canon is a big conservative conglomerate and operates at a glacial speed. They rarely aim to be first to bring 'revolutionary' technology to market but try to be best in their space, albeit coming from behind. Canon is also working on a full frame mirrorless camera. Since they are already 'behind' in this segment, their next full frame mirrorless camera needs to be bold and different. I am a wildlife photographer using Canon equipment for about 25 years and have followed the company since my first EOS-1 purchase in 1989. My advice to them is bring out a top-of-the-line, full frame mirrorless camera with the EF mount as soon as possible. You can see my equipment bag and works on MichaelDanielHo.com. 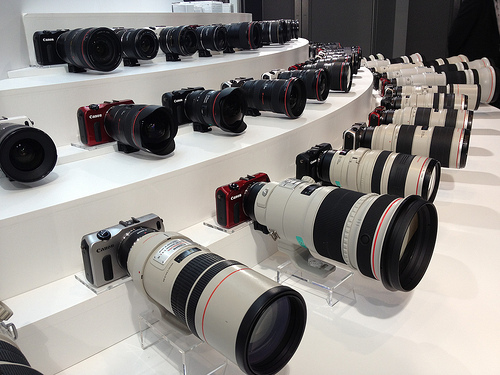 The fear that a full frame mirrorless camera may 'cannabilize' on Canon's existing full frame DSLR models is overblown. For example, all major luxury car brands have both expensive gasoline and alternative fuel powered models in their lineup. Many serious and professional photographers, including myself, will buy a high end mirrorless camera in addition to their current DSLR equipment, provided it meets the requirements. During the Canon Expo 2015 last month, the company demonstrated some cutting edge prototypes, like the 250MP and 120MP sensors, ME20F-SH camera that shoots videos @ ISO 4000000+ and the EF 600mm f/4 DO BR lens. These eye-popping demonstrations may pay off once they come to market but deciding when to bring them to consumers seem to take too much deliberation. In the next few months, Canon is expected to announce more EF lens, the long awaited EOS-1D X Mark II and EOS-5D Mark IV cameras. Although Canon reported less than stellar third quarter financial results recently, they are hardly unique and the company is still profitable and healthy. Management needs to make bolder decisions faster and lead their competitors for a change.